I’ve never been a big fan of candy companies that refer to candy as a guilty pleasure. Why can’t it just be a pleasure, without all these extra hangups? As long as you’re not eating as much candy as I do, you’re probably fine. Skinny Cow, with its ridiculous svelte cow logo, clearly markets itself to dieting women. This package of their caramel filled chocolates, which they were handing out as free samples at Sweets and Snacks, was clearly labeled as containing 130 calories. 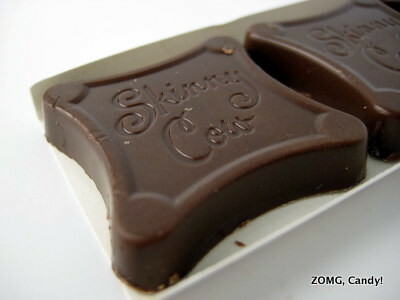 The package contained 3 pretty chocolate squares, each lightly imprinted with the words Skinny Cow. 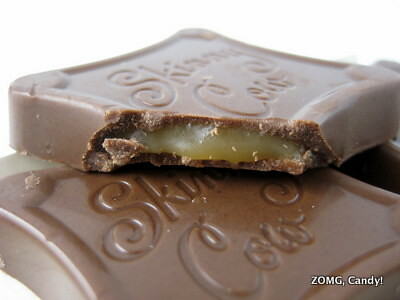 The caramel inside was thin and runny with a slight grain to the texture. The chocolate was grainy as well – definitely a few hours of conching shy of being velvety. It was extremely sweet, to the point of being throat burning. The caramel was similarly sweet, but it also packed a heavy hit of saltiness, which was a nice surprise. It helped bring a little more interest to treat, and it provided the flavor of something besides just SWEET. Still, I’d rather have one really high quality chocolate covered caramel than three of these guys. Quality over quantity! But if you prefer quantity, or if you absolutely need know the calorie count of what you’re eating (made easier when your food is factory made! ), these wouldn’t be a terrible compromise. An O.